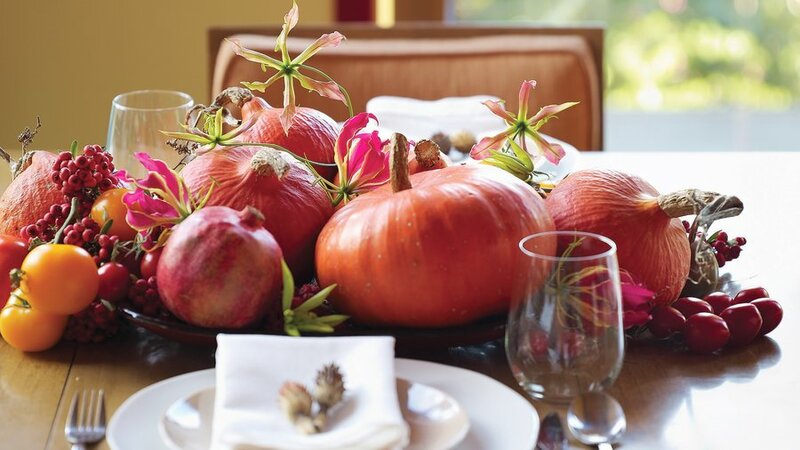 Here, red-orange pumpkins mingle with glory lilies, pomegranates, red winter berries, and ― most surprisingly ― golden and cherry tomatoes. 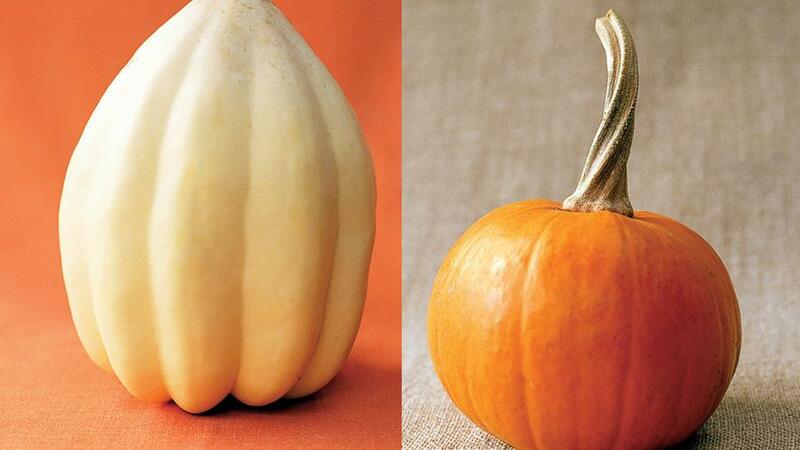 The sculptural quality of white pumpkin varieties really pops against wood paneling. White anemones and an assortment of seedpods, leaves, and acorns in a medley of browns complement them here. 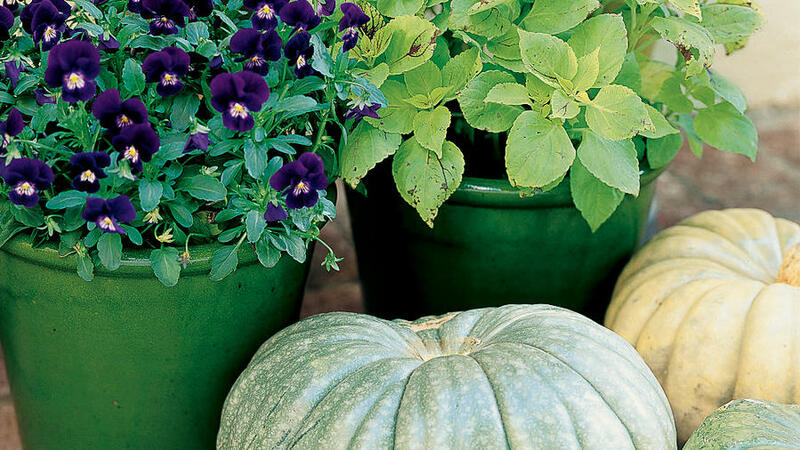 Try propping some fall pumpkins vertically for added height and texture. 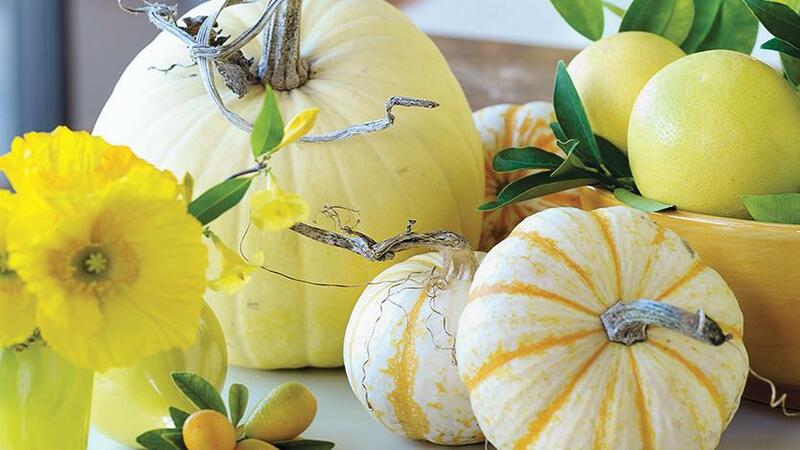 Striped yellow pumpkins lend a lighthearted twist to the traditional fall palette. Combine them with yellow Iceland poppies, kumquats, and grapefruits in a sunlit space; leave citrus leaves and twisted pumpkin stems intact for a just-picked feel. 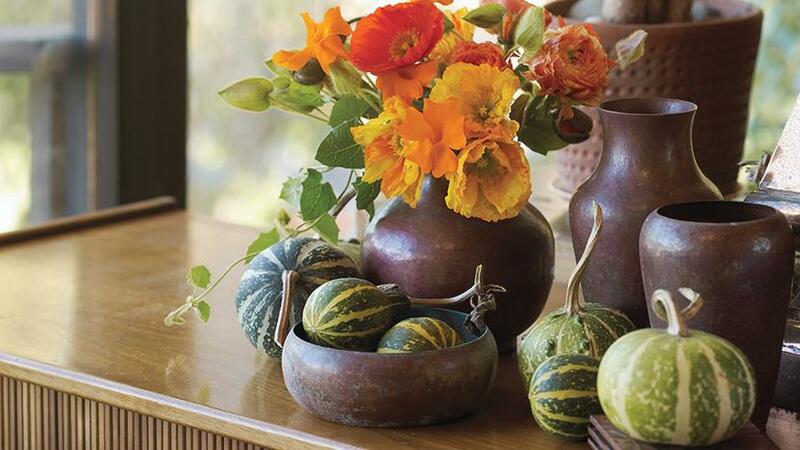 Miniature striped green-and-yellow pumpkin varieties join a trio of copper vases and a casual arrangement of red, orange, and yellow flowers. It's all about fall color ― without a maple leaf or corncob in sight. When the seasonal bounty is this gorgeous, it's best to leave well enough alone. 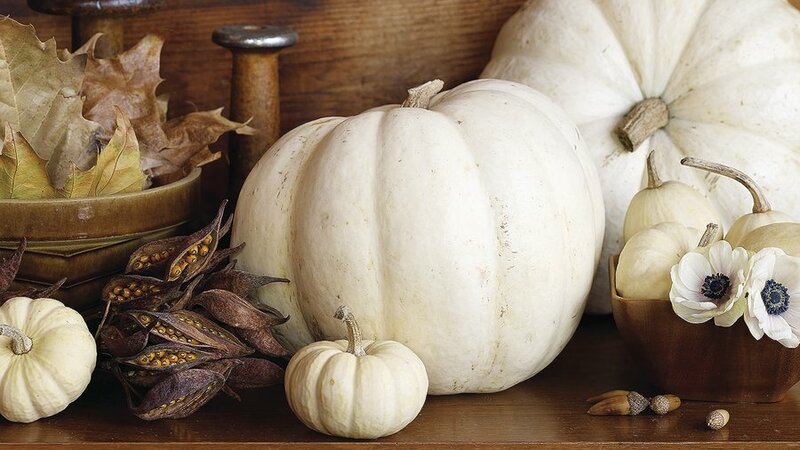 That's the thinking behind these casual arrangements of squash and pumpkin varieties in their fresh-from-the-vine state, assembled in minutes at the Apple Farm in Philo, California. 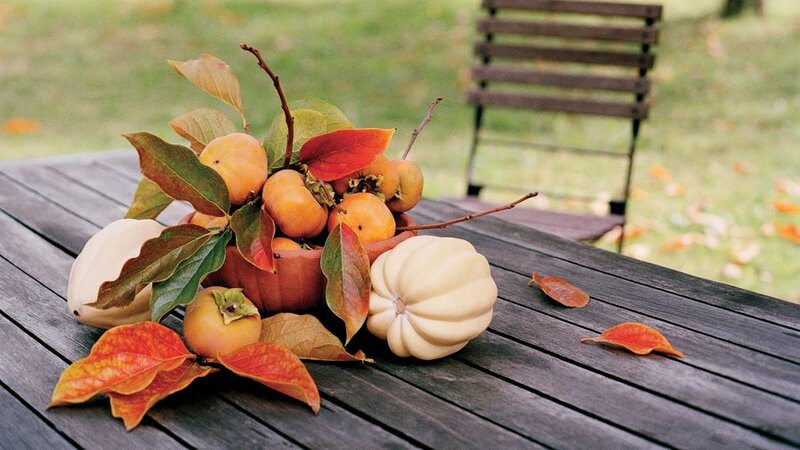 Mixed with leaves, berries, and fruits clipped from the garden (or readily available at florists and grocery stores), plump pumpkins and winter squash dress up a porch or patio table. Add height A terra-cotta bowl forms the base, elevating a mound of persimmons above the rest of the arrangement. Contrast shapes Persimmon leaves and branches jut out at various angles, breaking up the roundness of the fruit. Contrast color Creamy acorn squash provides the finishing touch. 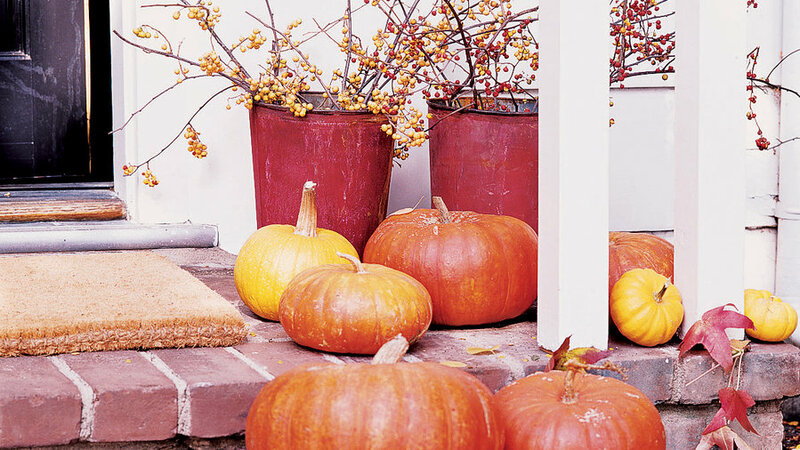 Create a base Start with a trio of standard pumpkins (odd numbers create a more pleasing display). Play with texture and scale A miniature 'Munchkin' pumpkin at one end provides visual contrast. Two kinds of rose hips resemble miniature pumpkins. Tuck in fringe Birch twigs with leaves attached surround the central display. Pick one color from your home's exterior ― such as the porch, trim, or brick pavers ― and let it set the palette for the decor you choose. 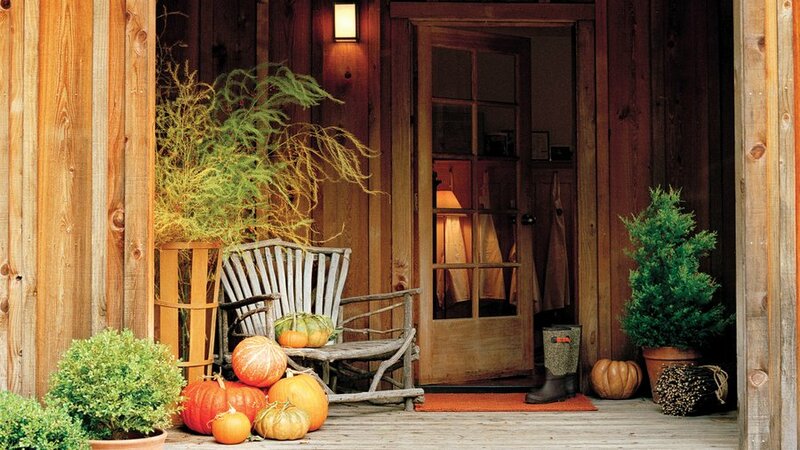 With all of the vibrant colors and textures of fall, a warm and inviting entry couldn't be easier to create. 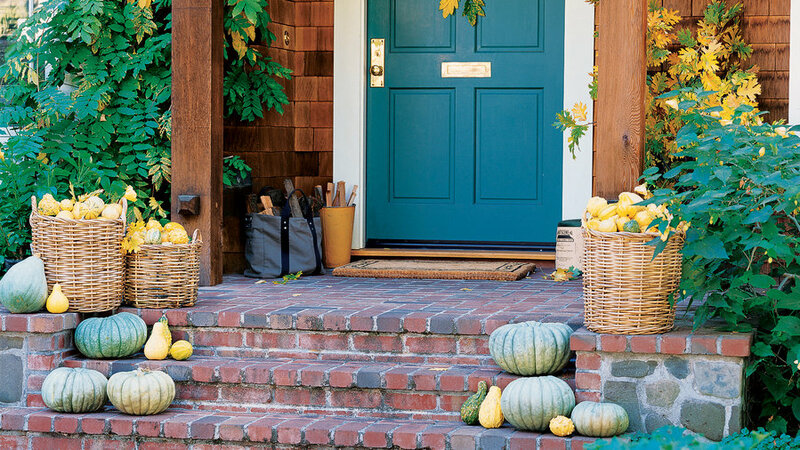 Cool harvest greens For this entry, yellow and green gourds and squash fill honey-colored baskets and sit among bluish gray pumpkins. A spray of wisteria leaves embellishes the front door; yellow and green oak leaves on branches fan out from a bucket just to the right of the front door. As the sun sets, white pumpkin varieties and potted white violas capture the fading daylight as no color can. 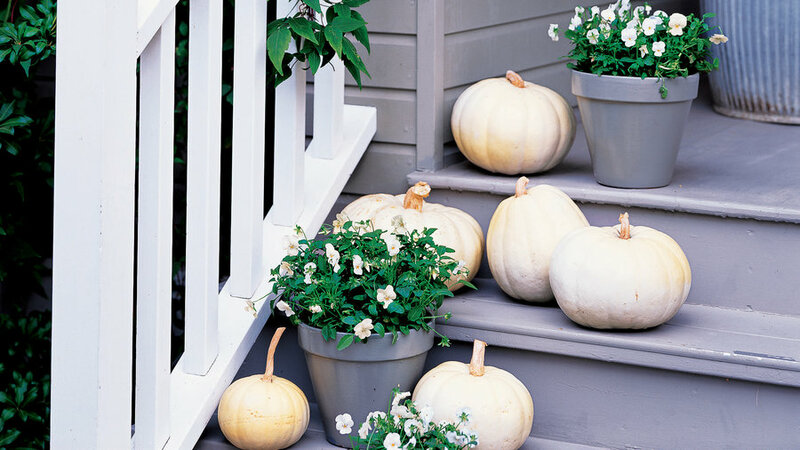 Terra-cotta pots are painted silvery gray to match the porch. Pots in different shades of green set the stage for this composition. Purple-flowered Johnny-jump-ups fill three of them; the fourth one holds coleus, whose chartreuse leaves are veined with dark purple. 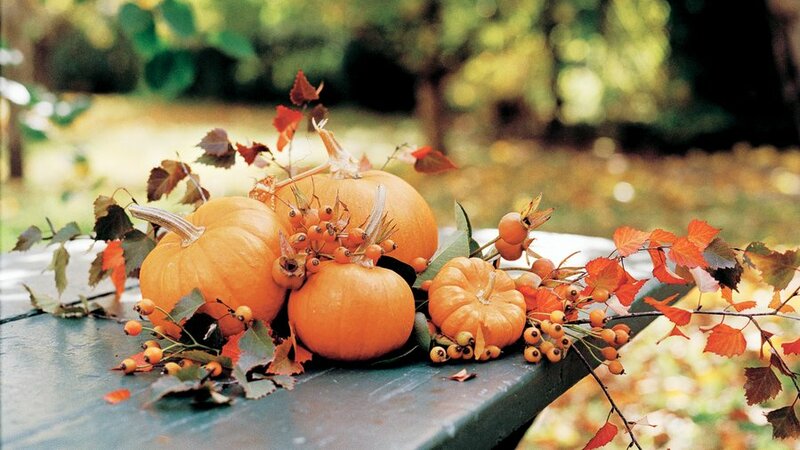 All make ideal partners for light-colored pumpkins. Coleus are best in warm climates and need to be brought indoors before the first frost. 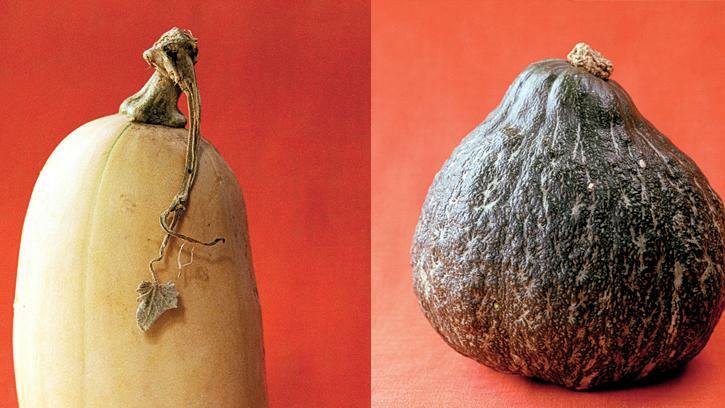 To gild a pumpkin, squash, or gourd, start by covering the area you want to remain orange with painter’s tape. Place in a box and spray a coat of gold paint on one side. Let dry, then turn and paint the other side. Remove tape when dry. For a slightly more textured finish, skip the spray and paint a few coats of gold acrylic paint on the squash with a foam brush. 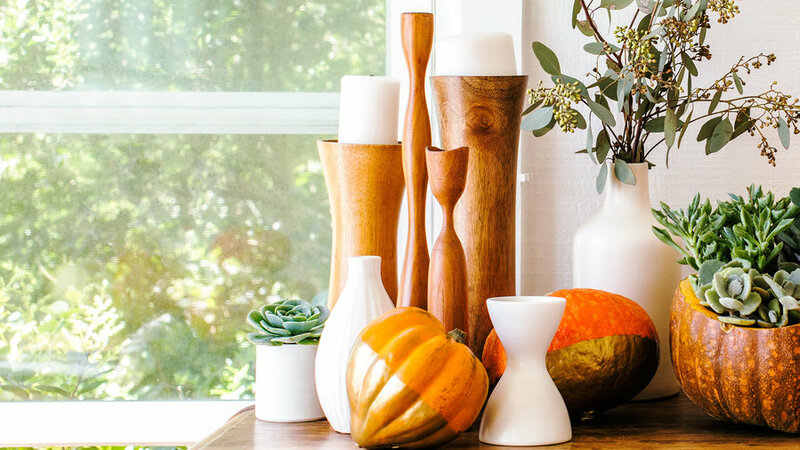 Display squash next to curvy vases to play up their shape. 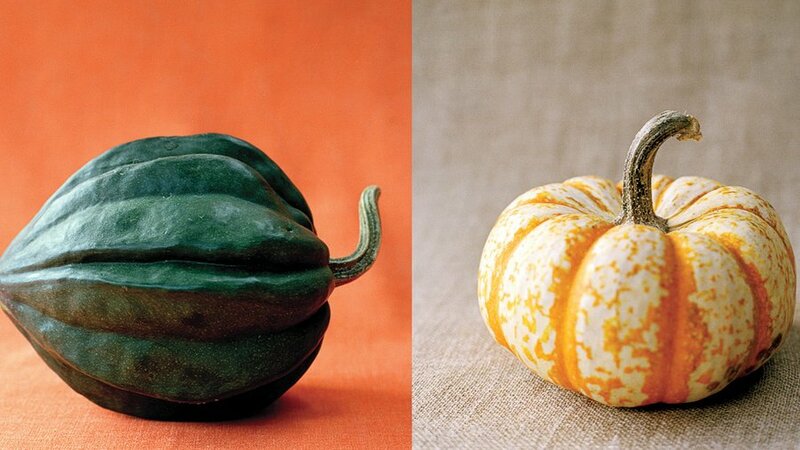 Round pumpkins or squash with flat bottoms, such as kabocha or Italian stripe, make great vessels for plants. Cut off the top third and hollow out the bottom two-thirds, leaving about an inch of flesh all the way around. Add a small amount of potting soil, then arrange succulents inside. Fill in any gaps with more potting soil. Use a small paring knife to cut a thin layer off the rim for a clean look. 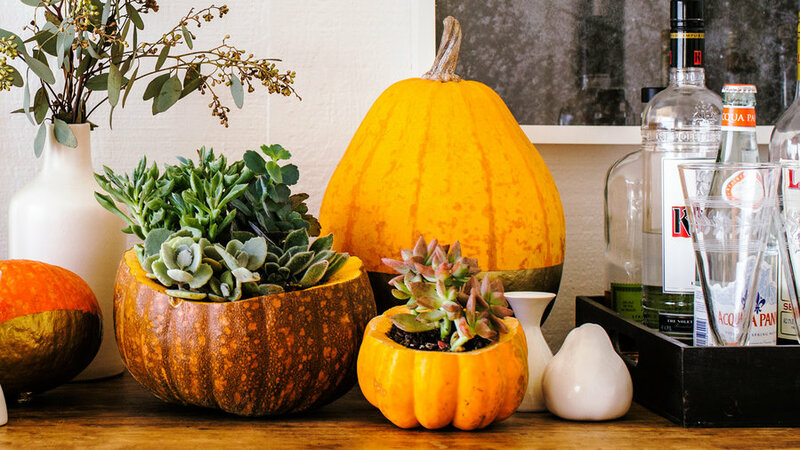 When the pumpkin or squash is past its prime, repot the succulents.